With growing concerns about avian influenza some poultry producers are wondering if there are ways to filter the air coming into their houses. Though on the surface this may seem like a good idea, the fact is that filtering incoming air is extremely difficult and costly. Furthermore, we must ask ourselves if filtering the air entering our houses would be an effective use of time and resources. There are poultry facilities with specifically designed ventilation systems to prevent outside pathogens from entering a house. These totally-enclosed, filtered-air, positive pressure (FAPP) houses are typically used for conducting disease research or producing eggs for vaccine manufacturing where it is crucial that fresh air entering the house is pathogen free (Figure 1). In a FAPP house outside air is drawn by very powerful fans through high efficiency HEPA filters that are capable of removing 99.97% of the particles 0.3 micrometers or larger from the air. To put the size of the particles filtered out by the filters in perspective, the period at the end of this sentence is 600 micrometers. The air is then pushed into the house and distributed through the use of a duct system (Figure 5). The exhaust outlets in the house are relatively small which creates a very high positive pressure within the house. The positive pressure aspect of a FAPP house is effective in preventing unfiltered air from entering the house. Virtually all of our poultry houses are negative pressure rather than positive pressure. In a negative pressure house a significant percentage of the air will enter the house through cracks during cold weather regardless of how tight it is perceived to be. For instance, even in a very tight 40' X 500' house (static pressure test value of 0.20" with a 20,000 cfm fan) there is over nine square feet of cracks in the house. This means during minimum ventilation possibly only 65% of the air is entering through the inlets. If there were filters on the inlets, 35% of the air entering the house would be unfiltered. In a looser house (static pressure test value of 0.05" with a 20,000 cfm fan), 85% of the air would enter through cracks which means less than 15% of the air would enter through filtered inlets during cold weather. In a FAPP house even if there are cracks, air will flow from inside the house to outside at relatively high velocities, preventing outside air from entering the house (Figure 3). Furthermore, the fans creating the positive pressure are always operating, assuring there is never a time that outside air can enter the house unless its brought in through the HEPA filters. It is important to realize that since HEPA filters are designed to remove very small particles, they are very restrictive to air flow. For instance, pulling air through the typical evaporative cooling pad at 400 ft/min will result in a pressure of approximately 0.06". Pulling air through a typical HEPA filter the static pressure would result in a pressure of 1.00", far beyond the capability of the typically poultry house exhaust fan! As result, the blower fans in a FAPP house use substantially more power per cfm moved than what is used in the typical poultry house. To lower the pressure to what a typical poultry house exhaust fan is capable of working under (<0.20") would require an air speed through a HEPA filter of typically less than 100 ft/min, thereby requiring a minimum of 200 square feet of very expensive filter material for a single 48" fan. 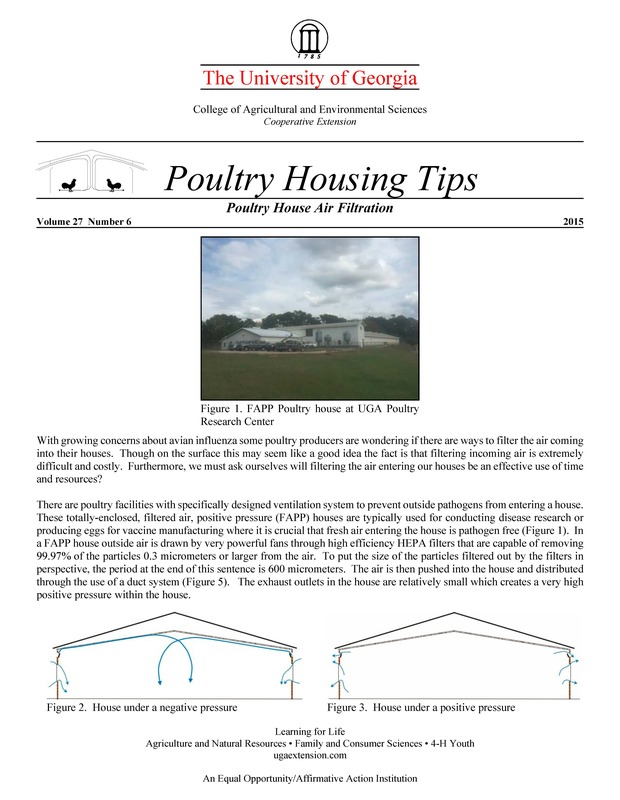 Figure 1 shows a FAPP house located at the Poultry Research Farm on the campus of The University of Georgia. In this building there are two bird rooms capable of housing approximately 3,000 commercial layers. Each bird room is equipped with a 30,000 cfm air handling system with a 70 square foot HEPA filtration system. The air handling systems are powered by a 50 hp blower designed to move air under multiple inches of static pressure. As you might expect, the ventilation cost per bird of this type of system is extremely high. There are “filtration systems” currently being sold to commercial poultry operations that cost substantially less than constructing a purpose-built FAPP house. These systems typically involve installing filter material over curtain and/or side wall inlets. However, without modifying the ventilation system to positive pressure, they may reduce the potential for disease carrying particles from entering the house but they cannot eliminate them. Furthermore, filter material can become quickly loaded with large dust particles generated by the birds on the farm. The clogged filter material will further reduce house air exchange rates leading to diminished air quality, which in turn will lead to bird performance and health issues. This brings up a very important question. How likely is it that AI would be transmitted to a farm through the air? Epidemological studies from the AI outbreak in the Midwest in the spring of 2015 indicate that the vast majority of breaks can be traced to people or equipment moving from one farm to another or farm workers carrying AI virus from outside the house into the house. There were few cases where aerial transmission was suspected, but these have not been definitively confirmed and most experts do not think air transmission is a major concern. It is more important to keep in mind that AI prevention efforts should first and foremost concentrate on proper farm biosecurity practices. Quite simply it’s people, equipment, wild birds, rodents, etc. that are the most likely transmitters of AI and not random dust particles. This is why the most important aspect of FAPP houses is that are surrounded by fences, no vehicles can enter the gated area, and most importantly people must shower and change clothes before entering the house. Extreme caution should be taken when considering the installation of a filtration system on a commercial poultry house. The ventilation system in the typical poultry house is simply not designed to handle the force required to pull air through the type of filter material needed to remove the particle sizes that are of primary concern. Air exchanges can be significantly reduced by the installation of filter material over curtain or air inlet openings. Over time air exchange rates will be further reduced as the filter material becomes clogged with dust or even moisture. As a result, if the filter material is installed in the fall, come springtime when the threat from AI may be at its highest, dirty filter material may need to be removed to allow sufficient fresh air to enter a house to prevent overheating and/or air quality issues. Properly filtering the air entering a poultry house is extremely difficult and expensive. Though filtering the incoming air may prove a sound investment on some farms with extremely high-value birds, (ie., primary breeding stock), for most producers efforts should be concentrated on sound biosecurity practices.